I have to confess... I'm in love with the new 'lulu' collection by Stamping Bella! 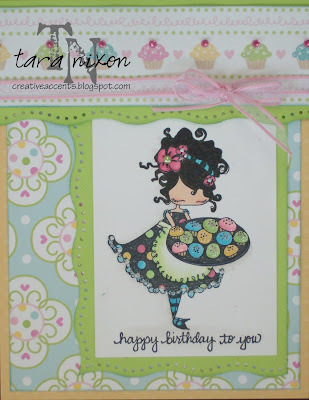 These two pretties are the first to join my stamp hoard and I had so much fun colouring & creating with them! Of course, Harriet, HAD to be paired with these fabulous papers by Doodlebug, which I have been wanting to play with for a long time. I coloured her with my copics to match, used my brand new border punch by EK & finished it off with lots of glitter (including Copic Spica on her hair & stickles on the cupcakes), ribbon and a sentiment by A-Muse. Now Henrietta also had me crying out to use a certain line of paper we have in the store... I just LOVE these ones by Cosmo Cricket and once again coloured her up to match them. I sorta-kinda used an old Mojo Monda sketch, blinged her up (crimson Copic Spica on the cherries? YUM! 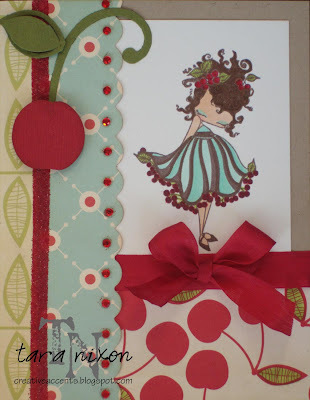 ), added silk ribbon & finally got a chance to use this 3D cherry from QuicKutz, too! ... and for some more lovin', here's a card I made for my cousin's wedding earlier this month. 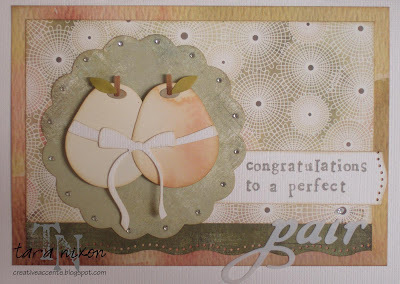 I'd been itchin' to use the pair of pears by QuicKutz on a wedding card & I LOVE how it looks cut out of these 'Porcelain' papers by Basic Grey (which, by the way is on sale 20% off this week... in fact, ALL Basic Grey & ALL embellishments are our deal of the week right now!). I pulled out my wooden alphabet stamps for this one, too- which I haven't used forever and they worked out just perfect ;) The QK font is the gorgeous 'Harvest' font, cut out of white fuzzy vinyl by QuicKutz- I love the loopies on it. Are ya feeling the love yet?